Colin O'Dell, as mentioned on his blog, has put together the instructions for something he calls "PHPUnicorn" (not to be confused with the PHP Unicorn conference) - a real-time system for visualizing unit test results via a Raspberry Pi, some LEDs and a Unicorn pHAT board. For Pi Day 2017 I created a really fun project - the PHPUnicorn! A simple PHPUnit listener collects test results and sends them to a Raspberry Pi Zero Wireless device in real-time. As the device receives the stats it lights up LEDs green, red, or orange to visualize the progress and results of your unit tests. The full instructions are over in this article on the Hackster.io site providing you with a list of the components needed, how you'll need to extend PHPUnit with a custom listener and a simple Python script to interface with the Pi and Unicorn board. The end result is a set of LEDs on the board showing the progress (and failures) of your unit tests being run. 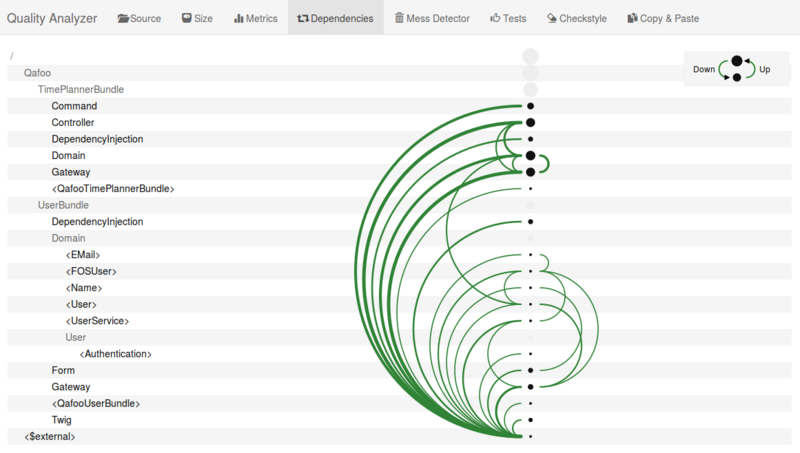 QaFoo has posted an announcement to their blog about a new tool they're offering to help developers better visualize the quality of their PHP code with a new visualization tool, the Quality Analyzer. 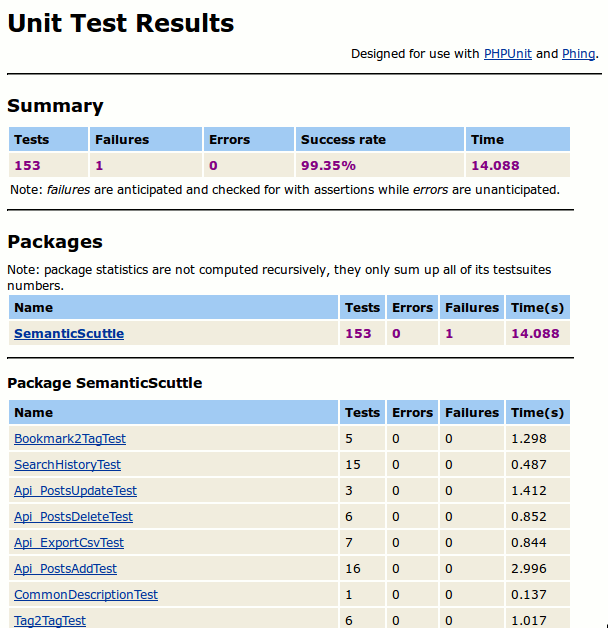 In code reviews we often browse metrics, source code and reported code issues together with our customers. This leads to discussions about the current state of the code and possible improvements. First we used a bunch of shells scripts for that. In a second step we developed a simple PHP (Open Source) application helping us to do the job. Now we did the third step and rewrote that application into a React based client side (Open Source) application. They start with an overview of why they created the tool (an evolution of the older Code Review tool) and why it was split into a frontend/backend model to provide easier pipeline integration. They then introduce the functionality in the new tool, based on a D3.js interface. A few screenshots of the interface are also included to give you an idea of how it reports its findings and the dashboard providing an overview of the findings. You can try it out by grabbing it from the project's GitHub repository. Running the specific test cases for the part of the application you're working on is easy and fast, but that does not tell you when changes in part A of the app break part B - which happened several times, and all just because I didn't want to wait 45 seconds again and again. So a solution was badly needed; tests should be as fast as possible; preferably < 10 seconds. Before being able to make the slow tests faster, I had to find out which of the 80 tests were slow. 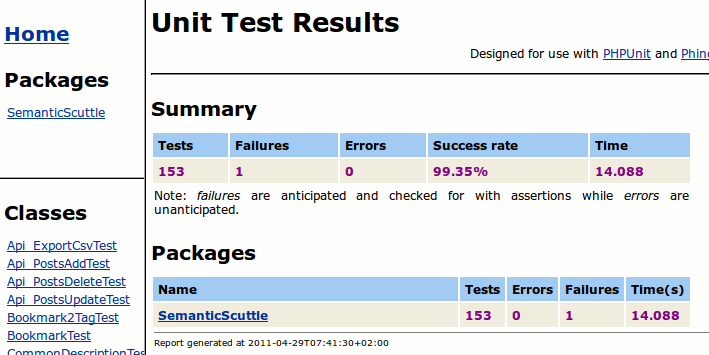 Tools like Jenkinks give more detail on test runs, but a normal PHPUnit install won't. So, he came up with a method that uses Phing's phpunitreport task to generate extra reporting easily. Here's some example screenshots: test results summary, test detail and single page views of the same sort of data. On his blog Sebastian Bergmann has a recent post about how he's visualizing PHPUnit's development and pushing that information into a video based on the history of the project. According to svn.php.net, I committed the first PHPUnit code to cvs.php.net on November 27th 2001 and the first release, PHPUnit 0.1, was made on December 1st 2001. 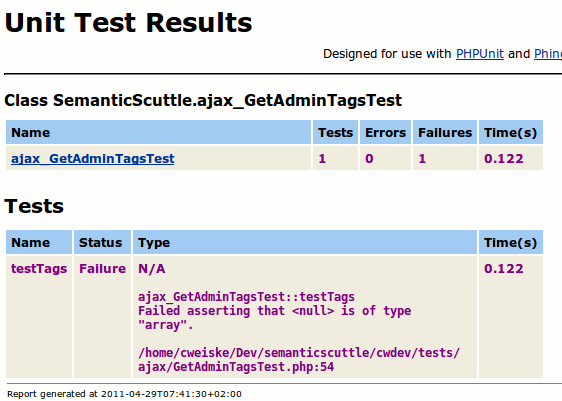 [...] On December 26th 2009, I moved the development of PHPUnit from svn.phpunit.de to GitHub. I imported the history from Subversion into Git. As you can see in the video, moving to GitHub lead to an increased number of contributions to PHPUnit. You can watch the video either embedded in his post or directly from Vimeo. It's interesting to watch the progress of the application and see the contributions make to each of the parts. The whole video, spanning the entire commit history of the tool, lasts about 25 minutes. Felix Geisendorfer is taking an interesting approach to defining programming in this new post to the Debuggable blog - he's coming at it more from the level of the perception the programmer has about writing good code. I believe understanding the patterns in your own thinking will by far make the biggest impact on how good you will get as a programmer. Forget design patterns, forget unit testing, forget all those functions you know. Important is to question why they exist and how they could be improved. He illustrates through a few examples what he means. He describes one such thought method, the "return home early" process - basically, if something looks too complex for its own good, it probably is. He offers a different way of thinking about it too, a more visual way that can help simplify things even more by laying out the pieces and seeing where they all fit. On his "Yet andother PHP blog" today, William Candillon shares a script he's written up to create a visualization of the parse tree of a bit of PHP source code. I wrote this xslt stylesheet to visualize the parse tree of a PHP source code. The stylesheet can actually convert any XML tree to graph in the dot format interpreted by Graphviz. His code is a simple seven line script that outputs a nice, clean tree structure image of how the process flows. He includes links to all of the source and files he used to create the tree image.